The RRP is the same as the 2010 vintage, yet the quality has come along even further. Big tick. On a side note, my first published article was on Holm Oak’s Moscato, also in 2010. Timing. This is pretty much the template of good northern Tassie Pinot. Dark ruby coloured, the nose carries a mix red cherry and plum ripe fruit, with some deeper animale stalk (10% whole bunch) and a lick of vanilla. 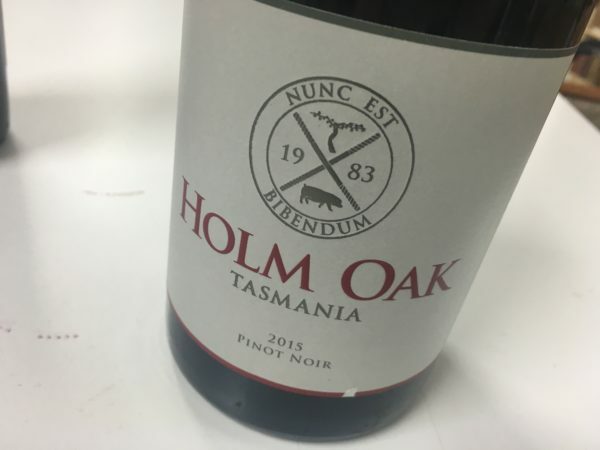 It’s built generous and full (not surprising in the ‘Riverland of Tasmania’ as Joe Holyman calls this part of the Tamar), and almost syrupy at times, before tightening on the finish with light tannic grip. Juicy, approachable and yet not un-serious, this is so very likeable. Best drinking: 2016-2021. 17.7/20, 92/100. 13%, $32. Would I buy it? I’d share a bottle.